In terms of heritage, Dzongs of Bhutan have their own value as the most striking indigenous architecture of the country. Generally, they are the large white-washed forts with inward sloping walls to give an illusion of larger space that what they possess. These are the center of district administration and religion in the country. Another astonishing facet about the dzongs is that each district of dzongkhag has its own dzong. This facet has definitely added on to the value and variety to Bhutan’s heritage and culture. Even each of the dzong has its own Tsechu festival where vibrant culture of the country is displayed through dances and the unfurling of the giant Thangka. Out of many such fortified dzongs, five of them stand out for their brilliance and unique confluence of religion and district administration. Let us explore five of the astonishing dzongs in Bhutan briefly. Punakha Dzong – The second of the dzongs to be built in Bhutan, Punakha dzong held importance as the seat of the country’s government and administration until Thimphu was declared the new capital in the mid-1950s. It is also the seat of the Chief Abbot, His Holiness the Je Khenpo. In terms of architecture and location, Punakha Dzong is arguably the most beautiful dzong in the country. Wangdue Phodrang Dzong – The scenic dzongkhag or administrative district) of Wangdue Phodrang has its centers in its namesake dzong. Founded by the Zhabdrung in 1638 atop a high ridge between the Punak Tsang Chhu and the Dang Chhu, this dzong is remarkable for its commanding view of the valleys below. The location is important in history as the second capital of Bhutan. It also has its own thondrol, depicting Guru Rinpoche that is unfurled each year in the early hours of the final day of the autumn tsechu festival. 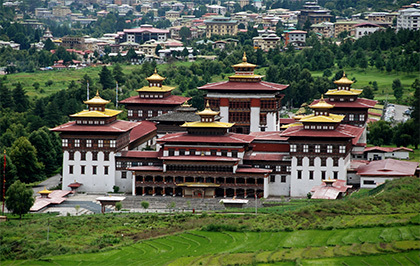 Paro Dzong – Paro Dzong is another impressive and well-known Bhutanese dzong. 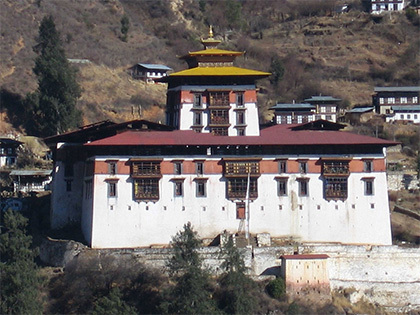 One may state that it is the finest example of dzong architecture. The massive buttress walls command the town in its own way. Visible from the valley, this fort also has a share of its history and importance in the past of Bhutan. The fortress was used on numerous occasions to defend the Paro valley from invasions by Tibet. Tsechu is the festival celebrated in dzongs. Each of the dzong has its own Tsechu festival that falls on a specific date. The celebrations usually don’t clash with each other, making it comfortable for tourists to focus upon one Tsechu celebration upon its coinciding with their trip.